PM Studio™ Online is the digital component of the PM Studio™ Toolkit. This cloud based platform is uniquely tailored to be used in any kind of project, small or large, simple or complex. Anyone can use this intuitive solution to manage any kind of activity in a one-man project or in collaboration with your team. Visual maps and interactive templates help to structure information in a clear and pragmatic way. Sign up for a FREE demo here ! An intuitive cloud solution focusing on project management activities and related project documentation. Simple online document creation through structured templates and reusable content. 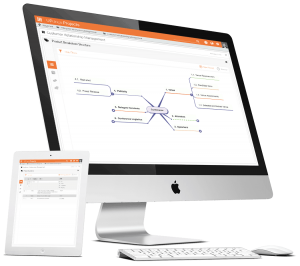 Easy communication and collaboration with your team and stakeholders via the platform. Smart tools to visualise information and project configuration. A GTD (Getting Things Done) Daily Log to manage all your ToDos. Microsoft Word Templates, Outlook conversations, Microsoft Excel reports, etc.